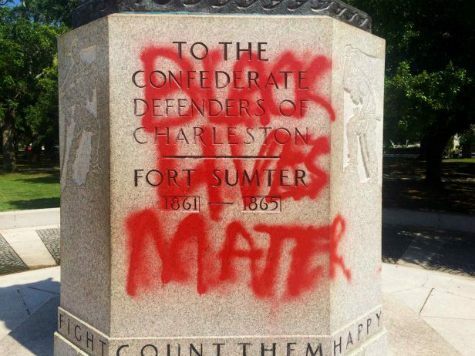 The spray-painted graffiti was discovered early on Sunday morning on a monument titled “Confederate Defenders of Charleston” just as citizens gathered downtown to honor the victims murdered at the Emanuel AME Church by a gun-wielding 21-year-old last Wednesday. Local residents of all colors have been urging outside agitators to stay away from their grief-stricken city. ABC reported that a pair of radical protesters from Washington D.C. were told to go back home as people met to consider what to do with the defaced monument. The Confederate monument was quickly covered with tarps on Sunday morning to keep people away from it as the turmoil over the church shooting continues to roil. The monument was erected in 1932 by the United Daughters of Confederacy and was originally paid for by private funds with a large grant of $100,000 by Charleston resident Andrew Buist Murray. The monument sits in White Point Garden, a public park at the eastern edge of the city near the harbor at the mouth of the Ashley River.